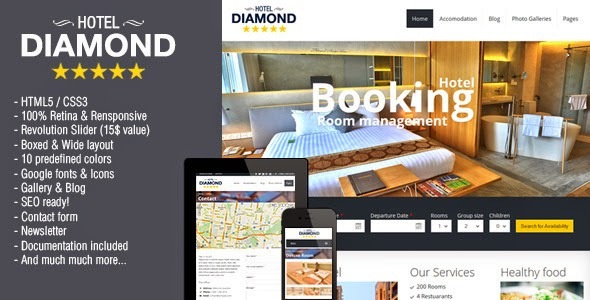 Hotel Diamond Template is a clean and complete Hotel Online Booking HTML5 Responsive Template for Hotels, Vacation Rentals, B&Bs, Service Apartments or any other kind of accommodation. Item Reviewed: Hotel Diamond - Responsive Hotel Online Booking 9 out of 10 based on 10 ratings. 9 user reviews.